Terra Lu is the group travel specialist for religious travel in Central Europe. Our origin is Terra Lutherana, the land of Martin Luther. The Terra Lu experience started in 1990 with a six-week European tour for a university choir. From that time on, more and more tour operators groups have used the inside knowledge of Terra Lu Travel for their study trip and leisure groups. All our trips are "hand crafted" as they are exclusively developed for the various wishes and needs of our clients. We are working as the B2B incoming agency for international travel companies and institutions who are dedicated to quality group travel. Terra Lu Travel & Consult GmbH was founded and is privately owned by Christian Utpatel, an expert in spiritual group travel in Germany and Europe for more than 25 years. In addition to his travel expertise Christian also is an ordained Lutheran pastor and bus driver. He sets up local contacts and provides ideas for making the trip to Europe an unforgettable experience. 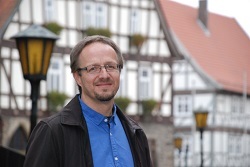 Christian is involved in many projects in the field of "church and tourism." Terra Lu Travel offers outstanding travel experiences to group-travel organizers, and also works with local tourism organisations in developing the best offers for travelling groups. Located in Germany and having long-established and ongoing local contacts, Terra Lu Travel is able to make arrangements which will take your group behind the scenes and provide a unique inside view of Europe. No two Terra Lu tours are the same, since each tour is individually designed to the specific wishes of the groups. All Terra Lu tour directors are trained by Terra Lu Travel and are experienced group leaders. Also local guides, who might join the group for specific tours, are hand-picked by Terra Lu Travel. Working for tour operators, Terra Lu Travel keeps its own name "undercover." From the welcome at the airport to the signs at the busses and announcements in hotels, the Terra Lu staff only uses the name of the contract partner. This way, travellers do not forget where they booked the tour, and Terra Lu Travel knows: It is your group. Photos Oberammergau: © Arno Declair and BAYERN TOURISMUS Marketing GmbH. Used by permission. Photos Erl: © Passionsspielverein Erl. Used by permission. Photos Sömmersdorf: © Verein Fränkische Passionsspiele Sömmersdorf e. V. Used by permission.